Rather than asking, which came first the chicken or the egg? One might ask which came first, Balinese or Indonesian food? Yes, Bali is part of Indonesia, but it is only one of the thousands of islands that make up the country. In other words, Indonesian food is a blanket term for the melting pot of dishes from many of its islands. Along with Dutch and Chinese influences created what is known presently as Indonesian food. As a result of Bali being home to the goddess Dewi Sri, it can be considered a cornerstone of Indonesian cuisine. Now that is a lot of responsibility, even for a goddess! For this reason, Dewi Sri is represented by statues throughout the Balinese rice fields. Likewise, she is also offered to at many rituals and festivals throughout the year. Fittingly, the rice fields are irrigated by Water Temples which are run by Priests. Rice is the staple of all Indonesian food, therefore, highly important and viewed as a staple of life. Due to these beliefs, the priests practice a philosophy relating to humans and earth with the gods to sustain life on the island. This practice is known as Tri Hita Karana. 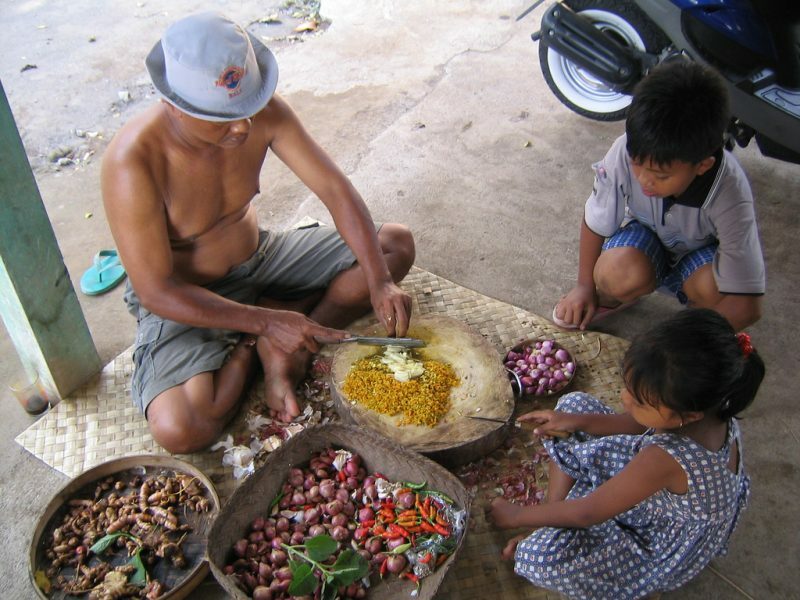 Along with rice, the Balinese contribute certain spices to the Indonesian food world. The Bali locals are dedicated to the beliefs and rituals which drives them to purchase fresh foods each day and prepare them for their families. Just imagine if everyone in the world had time for this type of tradition. In other words, visit the local market, cook, eat, reheat and repeat. 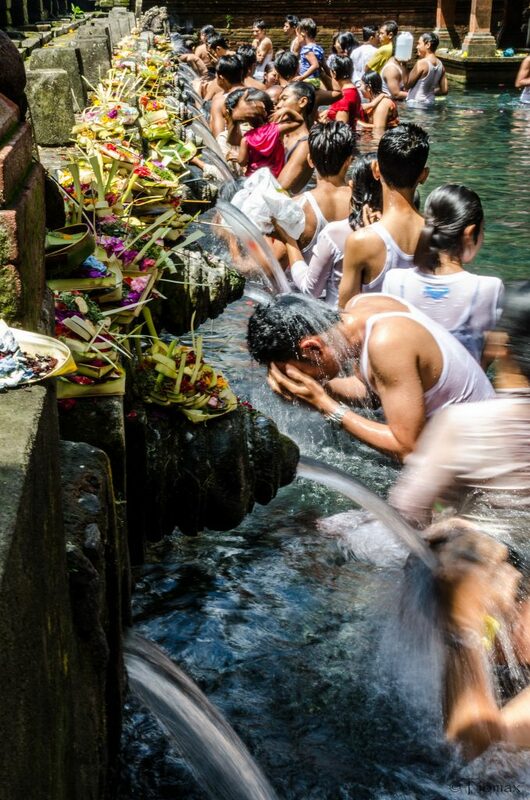 Generally speaking, this routine allows for health and prosperity, two main focuses of Balinese culture. First, let’s discuss the key components of culture in Bali. All in all, Balinese culture can be summed up with three things. Food, Art, and Religion. Truly, they all tie together to form an amazing balance of tradition and present-day life. Important to remember is that Bali civilization dates back to the stone age. Later, around 1293-1520 AD it’s customs and beliefs evolved. 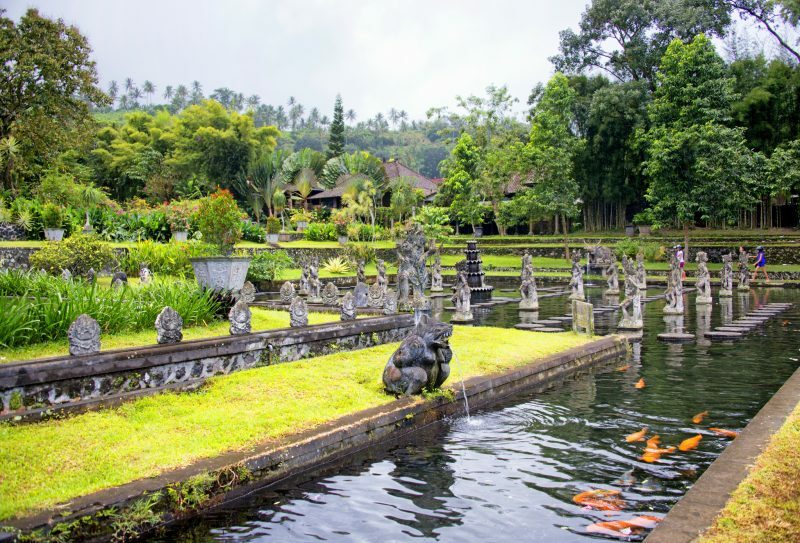 Today, while visiting Bali you can go back in time strolling through one of the islands many museums. There are artifacts and memorabilia along with information and documentation about the Balinese culture leading back to prehistoric times. In true Island of the Gods spirit, all things lead back to pleasing and feeding the gods. Must be lovely to be worshipped and offered to daily, where can we sign up? Unfortunately for us, the gods and their legacy go back centuries beyond our time. However, fortunately for the Balinese, their spirit is still alive on the island. To recap a bit, Indonesian food plays a huge part in satisfying the gods. 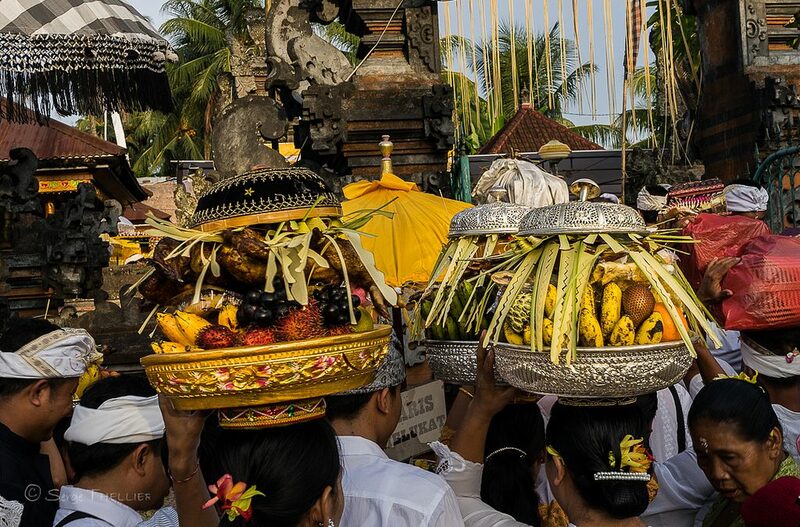 The people of Bali prepare special ritual dishes for every ceremony. Then, these dishes are carried to the temple where they are surrendered as offerings to whichever god is being celebrated. To explain further, these dishes are referred to as Prasada. An ancient Indian or Sanskrit word for, “food for the gods”. You see, it is the Hindu belief that food is valued as karma and thus you must offer before eating. Believe it or not, all of these dishes can be found in restaurants all across the island and made from various meats. For instance, some may use turtle or chicken while others prefer water buffalo or pig. Sticking with Hindu custom, beef is rarely used or consumed in Balinese culture. To begin with, the Balinese created dances as a form of offering for deities. Over time the dances took on new roles in the culture. 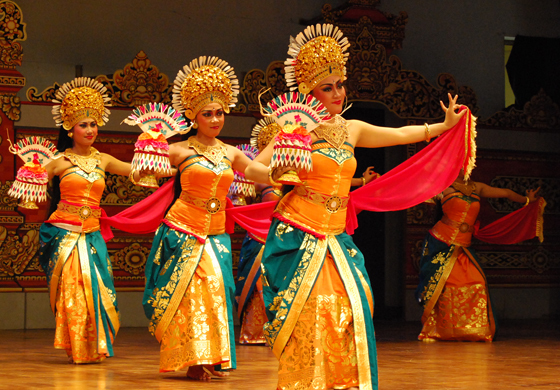 It is important to realize that performing arts in Bali are created from ancient Hindu Sanskrit tales. Coincidentally, this language also played a large part in naming types of Indonesian food. Again, the culture of Bali consists of art, food, and religion. The most popular tales that are played out in dance are of Mahabharata and Ramayana, both romantic poems. 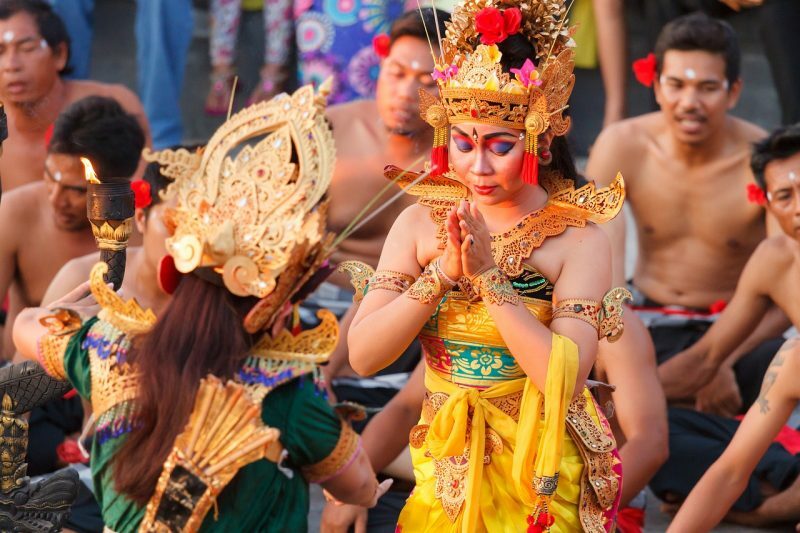 For the most part, the traditional dances of Bali are deeply religious and paint a picture of good vs evil. The dancers are all perfectly in sync and use intricate gestures of their fingers, hands, heads, and eyes. In addition, each dancer wears a vividly colored and decorated costume. The key to traditional dance is for the performers to be “possessed” by the spirits and enter a form of trance while dancing. To illustrate the act of good vs evil the artists take on the spirits of Rangda (evil witch) and Barong (good-hearted lion-like beast). Similarly, the welcoming dance, Pendet, uses flower petals to illustrate its point. Pendet is used before ritual ceremonies to purify the temple with floral offerings. Lastly the Joged dance, or entertainment performance, bamboo instruments known as Gamelan. This form of dance has no traditional meaning or purpose. It was created strictly to entertain. Uniquely, each Balinese community or Banjar, as they are referred to locally, has its own performing arts group. Ordinarily, the groups are made up of several community members of every age group. Certain dances are performed by certain ages or genders. Given that the island holds multiple festivals and ceremonies year round, the dance groups have no trouble staying busy. 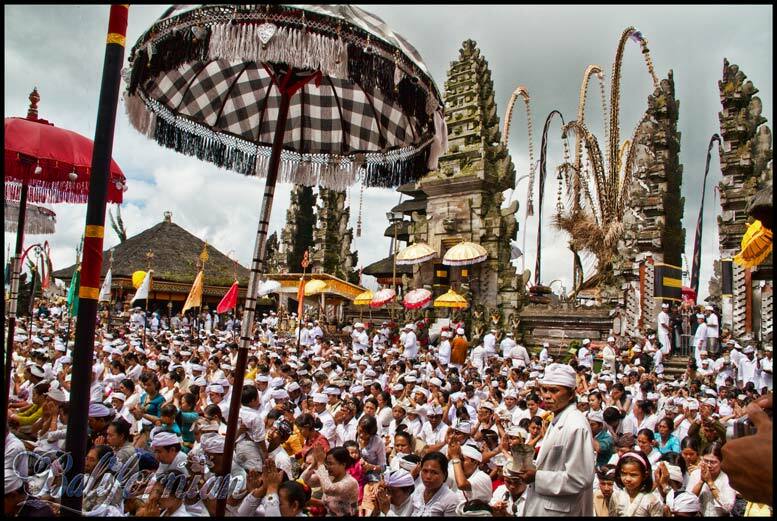 Much like the Temples of Bali these groups are built according to strict rules and structured around religious belief. Also on that same note, in order to be allowed entrance into either one, you must be dressed appropriately. It is not uncommon to walk the streets of Bali and see locals in their dance attire. They take great pride in the styling of their costumes. To summarize, these performing arts groups travel to each local festival on the island and compete. The groups compete against one another to win a chance at performing weekly in one of Bali’s entertainment venues. In this case, the winning group will perform weekly for a full year until the next group takes the stage. There you have it in a nutshell! Indonesian food, the culture of Bali, and a few new dance moves! All that is left is for you to decide when you are coming to experience it all. Would you be interested in taking part in a real Balinese ceremony in the most authentic way possible? Let us know, we will make it happen!